The time-proven Tri-Jet 6208 fogger serves the needs of a wide range of uses for both indoor and outdoor application. Food plants, hotels, barns, parks and hospitals are just a few examples of sites which depend on the Tri-Jet 6208 for effective treatment. This pioneering unit, now in its fourth decade of service, provides the standard of reliability against which other foggers are measured. It's in daily use for such diverse applications as controlling odors, disinfecting and sanitizing, carpet mildew control, flood and fire damage restoration, controlling mosquitos, flies and other insects, dispensing water for humidification and dust control and a host of innovative applications. 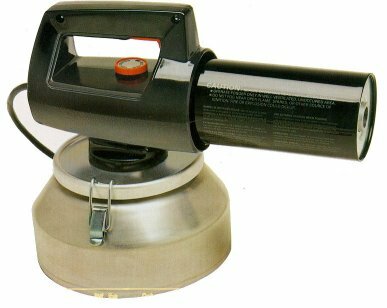 The portable Tri-Jet 6208 is a "cold fogger" -- it handles both water- and oil-based solutions -- and has a one-turn control knob to adjust particle size and degree of misting. The dispensing rate is easy to calibrate in the field to compensate for differences in liquid density or viscosity. 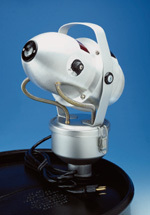 The Tri-Jet 6208 fogging head can be adjusted at up or down angles as required. Made of durable aluminum, it's lightweight, but tough enough to justify its five-year limited warranty. Purchase this fogger on line here Holds 3 Quarts Liquid. Used For Insecticides & Deodorants. Can be used with heating element or without for cold sprayer. A 10-turn precision needle valve controls liquid output and droplet size. Set the valve to a low flow rate to produce near-invisible ULV droplets. For heavier fogs and mists, Increase the flow rate. Once the valve has been set, you can use the vernier calibration to return to the same setting, or snap a lock ring to prevent accidental changes. Chemical flow rate is easily calibrated in the field to adjust for differences in liquid density, viscosity or surface tension. And since the Micro-Jet handles both water- and oil-based liquids, this one machine can satisfy all your fogging requirements. The Micro-Jet ULV is widely used in schools, restaurants, zoos, barns, hotels, and similar locations requiring professional application. Light-weight, and supported by our five-year limited warranty, the Fogmaster Micro-Jet ULV is an outstanding choice. The Pow-R-Jet® Plus DM 6428 is mechanically identical to the durable 6329 model, but includes a one-turn control valve to allow you to adjust liquid output (0-10 oz/min) and droplet size (intermediate fog to heavy wet fog). Higher flows produce larger droplets. The dispensing rate can be calibrated in the field so you get predictable output for all fogging solutions, despite changes in viscosity and density. 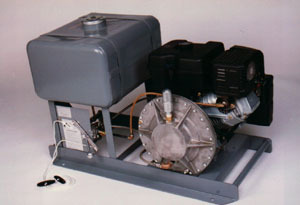 And, since the Pow-R-Jet Plus DM is a "cold" fogger, using shear turbulence, it handles both water- and oil-based liquids. Barns, restaurants, greenhouses, dairies and warehouses are a few examples of larger application sites relying on this product for everyday use. For effective fogging solutions, for insect fogging or insecticide fogging use the Pow-R-Jet fogger. SPECIFICATION SHEET LINK HERE & PURCHASE HERE. 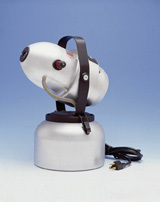 The Fogmaster Noz-L-Jet(TM) 7807 fogger features a hose and wand with discharge control. Lightweight and portable, it allows "spot" fogging without filling the room or wasting chemical. When you want fog, just aim the nozzle and press the thumb valve. 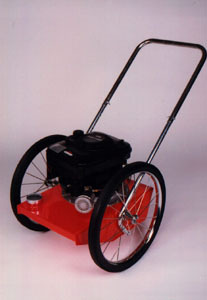 It's spring loaded for one-handed operation, but can be latched "on" if you want continuous output. No matter what your task, the Noz-L-Jet's powerful 30 cfm blower makes it quick work. A separate regulating valve in the power head controls droplet size in the discharge stream. Open up the valve for large mist droplets which settle quickly. Turn it down for small fog particles with longer float times and better penetration. 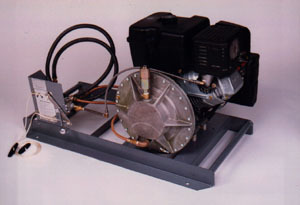 First developed to apply germicides to air-conditioning ducts, the 7807 has proven useful for other "directed fog" applications including removing smoke odors from draperies and upholstery, applying anti-mildew chemicals beneath carpets, and pest control in restaurants and commercial kitchens (treating wall voids, above ceilings and under appliances without filling the room with fog). SPECIFICATION SHEET FOR 7807 LINK HERE & PURCHASE HERE. 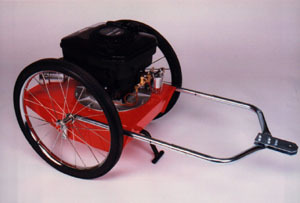 Engine: Briggs & Stratton Heavy duty, 4-cycle Horsepower: 5 h.p. Weight: 82 pounds. Shipping Weight: 87 pound.Shipping Dimensions: (L)25" (H)21" (W)25"
Weight: 83 pounds. Shipping Weight: 88 pounds. Shipping Dimensions: (L)25" (H)21" (W)25"
Formulation Tank Capacity: Any size tank with gravity flow from bottom. Starter: Manual. Weight: 180 pounds. Starter: Manual. Weight: 210 pounds.